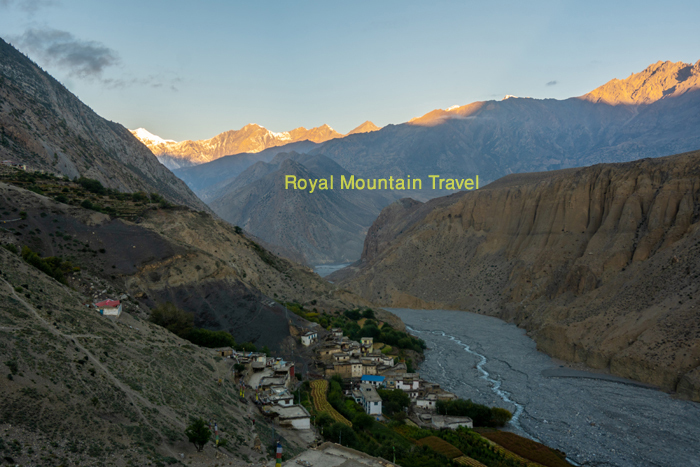 Flying up through the deepest river gorge in the world, you head up the mighty Kali Gandaki into the mountains. 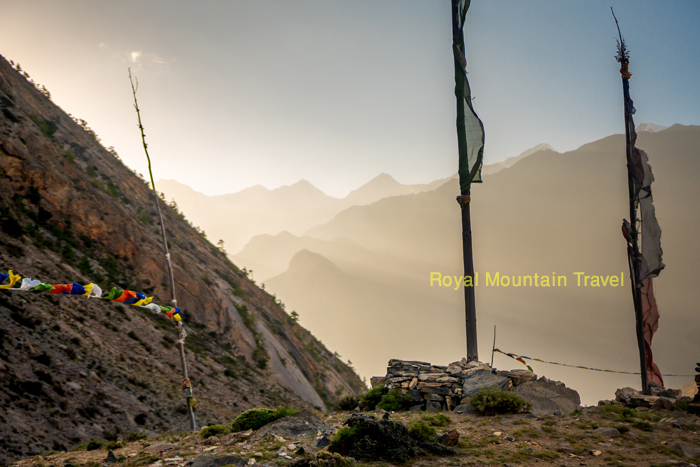 Touching down in Jomsom, you are driven to Kagbeni, an old trading point where Tibetans used to cross into Nepal. Here you can peak into the ‘Forbidden Kingdom’ of Upper Mustang. 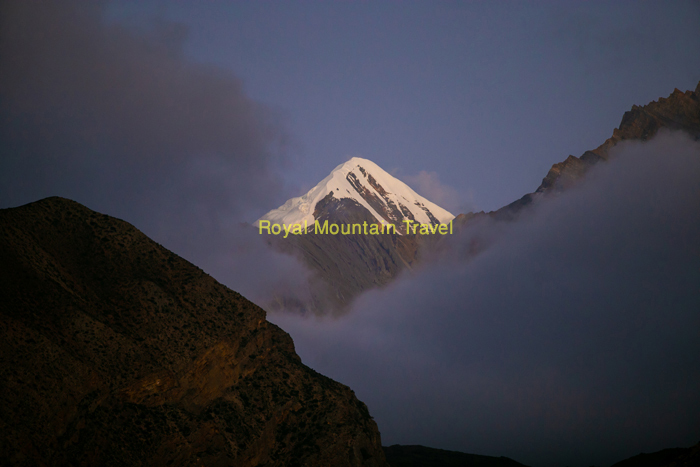 You visit the Muktinath, a very holy pilgrimage site where thousands of Hindu and Buddhist pilgrims come every year. Over these four days, you explore this fascinating corner of the Himalayas, visiting local monasteries, exploring ruined villages and looking in on meditation caves. 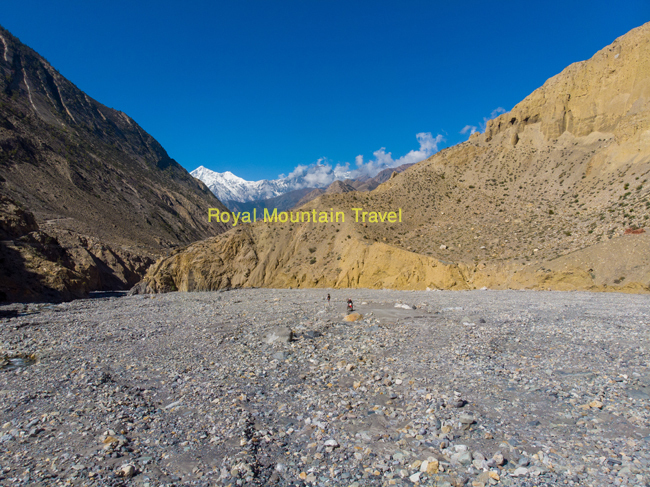 Hiking in Lower Mustang, you start early in the morning to avoid the sometimes fierce and cold winds that whip up the Kali Gandaki river gorge by late morning. Trek grade: The trek grade is 1-2 as the hikes are short and not at very high altitude (under 3000m). The only time you are walking at a higher altitude, this is to walk down from Muktinath. Day 7 Jeep to Muktinath; hike down to Jomsom. Personal expenses such as drinks, postage, laundry, communication, etc. Starting in Boudhanath, you will visit the largest Buddhist stupa in Asia which is the hub of Tibetan culture in Nepal. The 36-meter high stupa is one of the largest stupas in South Asia. It was built on the site where ancient Tibetan merchants used to rest and offer prayers over the centuries and formed a kingdom within a kingdom. Refugees from Tibet settled here and there has been the construction of over 50 gompas (Tibetan convent) around Boudhanath. Since 1979 a UNESCO World Heritage Site, along with Swyambhunath, it is one of the ‘must see’ popular tourist sites in the Kathmandu area. Close by is Pashupatinath another major religious site. Pashupatinath Temple, considered one of the sacred temples of Hindu faith sits on the banks of the Bagmati River in Kathmandu. The seat of the national deity, Lord Pashupatinath, the temple complex has been listed as a UNESCO World Heritage Sites since 1979. It is a collection of temples, ashrams, images and inscriptions scattered along the banks of the holy Baghmati. A major festival celebrated here is Maha Shivaratri when over 800,000 devotees visit here. Hindus believe in cremation within a day of death. You may see funeral pyres smoking as this believed to be one of the most auspicious places to be cremated. Continuing on to the third World Heritage site of the day, you are taken to Patan Durbar Square. Patan is now part of Kathmandu but used to be another of the three independent kingdoms. Very different in character from the rest of the city, Patan’s Durbar Square is surrounded by the most superb of Newar architecture. It is a beautiful ensemble of temples and shrines beside the old royal palace that now serves as a little museum. In Patan you can see a mixture of both Hinduism and Buddhism, with people worshipping in both at the same time. Renowned for the “Birth to Death” shops, these are where to shop for every little item that Nepalese rituals require from birth to death. There are many interesting festivals and traditions that are observed here. Catching a morning flight you have the rest of the day free in Pokhara. After lunch you are taken on a tour of the city, visiting Gupteswar Mahadev Cave, famous for its religious importance. You see Devi’s Fall nearby, which is impressive after the rainy season. Here you go down an underground staircase to approach the water that falls deep down. 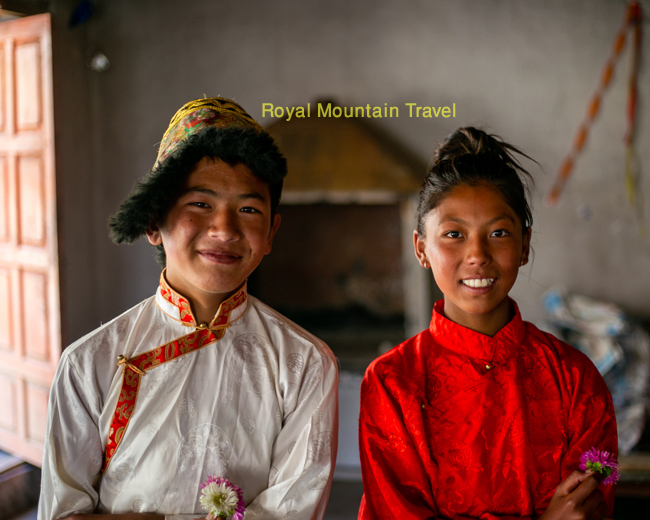 You also visit the Tibetan settlement where there is a nice little monastery, a school, and refugee jewellery and craft stalls. Here you can also see some beautiful handmade Tibetan carpets. Flying from Pokhara in the early morning, all flights go early to avoid the high winds that build up during the day. It is a spectacular 30 minute flight, not for the fainthearted as you feel your wingtips almost brushing the sides of the mighty Kali Gandaki river gorge and the massive Dhaulagiri mountain along the way up. As you go up, the landscape changes from the lush greenery of the Pokhara area to the barren, rocky terrain of Mustang. 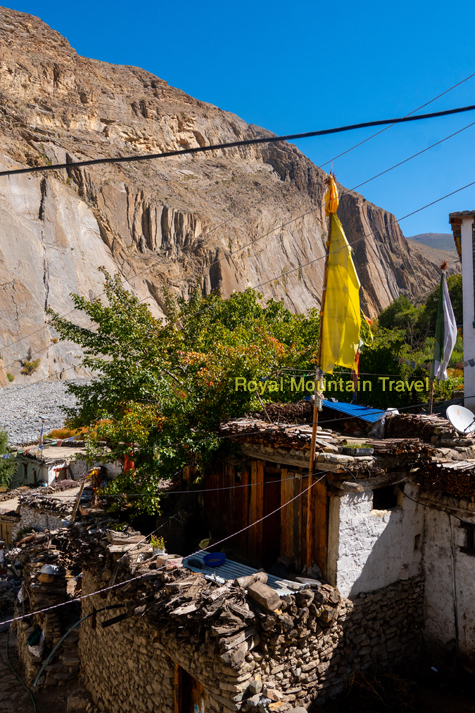 Taken by jeep up to Kagbeni, this atmospheric medieval town is a perfect base for exploring Lower Mustang. Hiking out from Kagbeni for a couple of hours, you stop for a leisurely lunch. You might feel the altitude a little bit, so take your time. Later in the afternoon, once you’ve rested and the winds have died down, you can stroll around the pretty town of Kagbeni. Spin the prayer wheels tucked in the narrow alleys, watch the local people do their daily chores, and admire the views of the monastery, the river and the mountains. After a good night’s sleep you should be ready for your next walk in the local area, to Thini village. 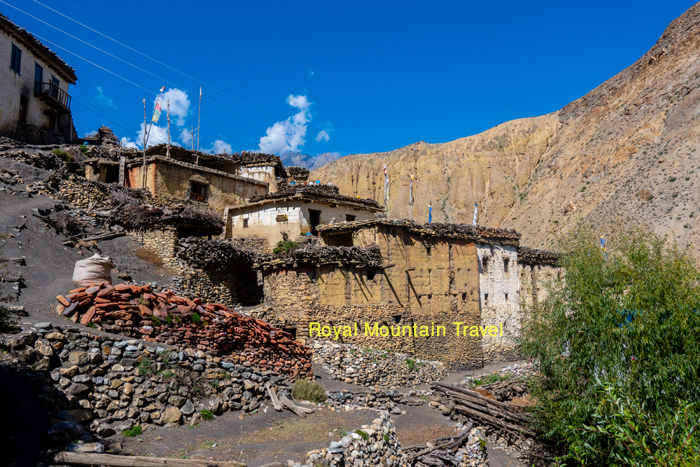 The culture in Lower Mustang is interesting and quite different from anywhere else in Nepal. The people are primarily Gurung and practice a Tibetan form of Buddhism which is obvious in the architecture, religious buildings, and the local dress. Returning to Kagbeni, after lunch and a rest, you can visit the monastery here, where the lamas will give you a talk about Buddhism and the way it is practiced in this area. This is a good opportunity to ask any questions about what you’ve been observing in Lower Mustang. This morning, you begin with a hike to the villages of Dakmar and Phalak, and then returning back to Kagbeni for lunch. Later in the afternoon, you learn how to make momos, the steamed Tibetan-style dumplings that are very popular throughout Nepal. They look deceptively simple, but they can be quite fiddly to make! But after this class you will have a new skill to take home with you—a long-lasting souvenir. Jeep to Muktinath; hike down to Jomsom. Driving up Muktinath you have time to explore this fascinating pilgrimage site high on the mountain that is sacred to both Hindus and Buddhists. The pagoda style Muktinath Temple contains one of eight such shrines (the others include Srirangam, Sri Mushnam, Tirupati, Naimisaranyam, Thottadri, Pushkaram and Badrinath). In front of the temple are two ponds. Thousands of devotees come here to attain moksha (freedom) from the cycle of birth and rebirth. On the way down, you visit Jharkot, an impressively fortified village with some ramshackle but picturesque old buildings and beautiful mountain and valley views. It has a lovely Kani (huge chhorten) and a large Shakya-Pa sect monastery. The monastery is situated close to the ruins of the old forts that were in Jharkot. The Tibetan name of the monastery is Ngorp and it is said that this monastery was founded during the regime of King Chopse. Four monks usually stay here and perform various ceremonies at different times of the year. It is the main monastery of Jharkot, Purang and Khinga people. Be ready for an early morning flight departure to Pokhara. Jomsom is small so it should not take long to walk to the airport. You have the afternoon free to relax, go shopping or visit some of the museums such as the International Mountain Museum (IMM). In addition there is an ethnographical museum, Pokhara Regional Museum and Annapurna Natural History Museum with collections of flora and fauna, and butterflies. There is also the Gurkha Museum featuring the history of the Gurkha soldiers. Gurkha soldiers are still recruited here in Pokhara. You have the day free in Pokhara. 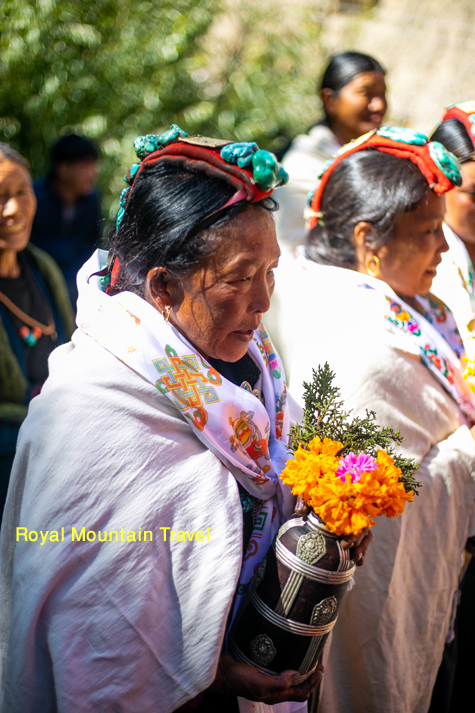 You might like to take a full day or half day Tibetan Encounter Day Tour to learn the history of Tibetan refugees in Nepal, visiting local schools and monasteries, and eating a traditional home cooked lunch at one of the Tibetan settlements. You might like to go boating on Lake Phewa and walk up to the World Peace Pagoda to admire the views. The Peace Pagoda offers good views of the Annapurnas, including the Fishtail, Dhaulagiri, Annapurna South, and Annapurna III. If you want a thrill, go paragliding or bungee jumping. Flying back in the morning, you are in Kathmandu in time for lunch and have the afternoon for last minute shopping or relaxing. In the afternoon, if you don’t want to do any more sightseeing, why not just hang out in the beautiful Garden of Dreams in Thamel, which used to be part of one of the old Rana palaces.